We received this for review purposes! Price: Please check the website for current prices. Do you have a history buff in your family? Do your students learn best when watching videos? Drive Thru History Adventures could be exactly what you’re looking for. 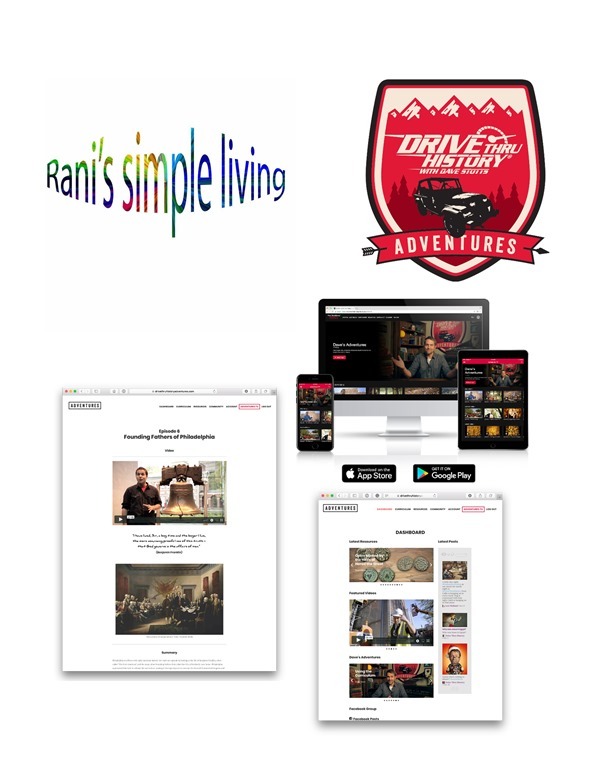 Drive Thru History Adventures has been developed by Dave Stotts, who has a passion for history and educating children. Currently this program has three online courses: Ancient History, Bible History (about the Gospels), and American History. Ancient History is a twelve week adventure through Greece, Rome, and Asia Minor. Bible History is an eighteen week adventure in Israel covering the life of Jesus. 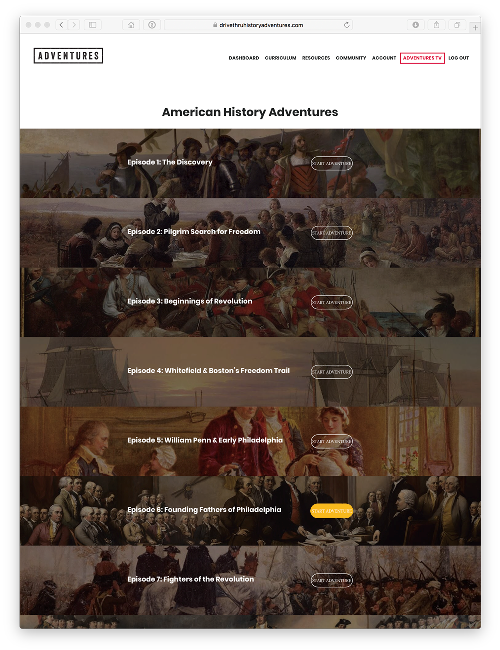 American History is a twelve week adventure covering the time from Columbus to the Constitution. Adventures TV is also included, where you can easily see all of the different videos at once. The app can be downloaded at the Apple App Store or on Google Play for free. You will just have to use your login in information. It is also available for the computer. We had watched several of the American History videos on DVD and enjoyed them, so I was excited to have access to all of the Bible, American, and Ancient Histories videos and curriculum. Since there were are three different history curriculums, I had B and C pick which one they would like to concentrate on. B chose American History and C chose Ancient History. I decided that we would watch the Bible History Adventures about the Gospels while we ate lunch and supper, so we could watch something that would help us grow in our Christian knowledge. Answering the questions after watching the video would add to a good meal time discussion. C and I watched the videos together, then worked on answering the questions. The next day we would spend time studying the paintings and other artifacts on the page. B watched his videos and studied the documents on his own. The two of us went over his questions verbally, instead of printing out the PDFs. We worked on at least one adventure per week. It is important to know what has happened in the past, so you can know how to determine the future. These three homeschool video curriculums can help with that. 1. Mr. Stotts has a lot of passion for history and it shows in the videos. His humor wants you to watch more. 2. The questions, paintings, sculptures, and other objects, along with the extra short videos and articles make this a good curriculum for older students. 3. I think it’s great that more videos and information are added weekly. 4. 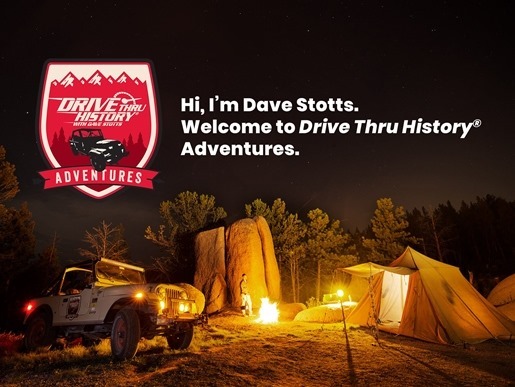 Dave’s Adventures with the weekly updates is a great way to learn what is currently happening with Drive Thru History Adventures and Mr. Stotts. 5. If that wasn’t enough videos, there are videos for Behind the Scenes and Sides Roads (Saint Valentine’s Day, Roman Coins, and “The History of Cheese”). 6. The website was easy to navigate with well defined sections. The kids and I were able to find exactly what we were looking for. 7. Adventures TV is good for when you’re sick or when you want to easily pick the exact episode you want to watch. When B was sick, he enjoyed picking exactly what he wanted to watch from all of the available videos: Dave’s Adventures, Bible History, American History, Ancient History, Side Roads, Behind the Scenes, and Digging Deeper. 1. I really enjoyed seeing the paintings, sculptures, coins, and other artifacts, but we were unable to view many of them without having to scroll to see the whole object on my Windows 7 Gateway computer. 2. I have an android phone, so I downloaded the app from Adventures TV. 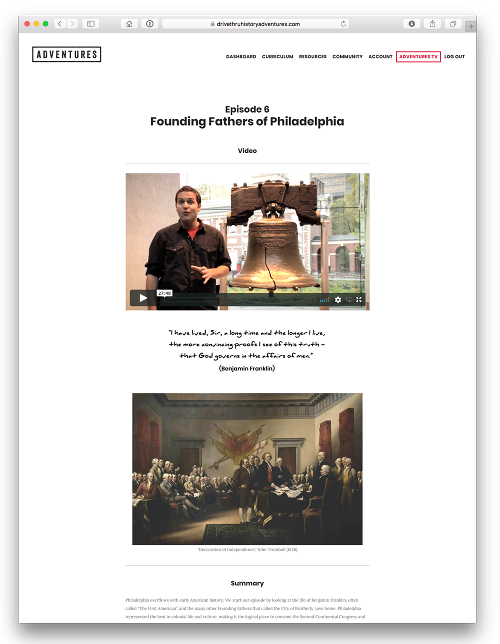 I liked how we could easily view the homeschool videos on the go. I was unable to rotate the screen so the video was very small. 3. I thought that the videos for Ancient History Adventures seemed really long at 45 minutes. I really liked Drive Thru History. I thought that it was good. One of my favorite parts about it was all the videos. In general, the videos were very funny, and I really had a good laugh watching them. I also thought that the questions where very good, as it really helped you think in depth about the video. The videos where chock-full of information and were very helpful to learn about a specific topic. For example, the main thing that I did was the American History Curriculum. The videos were clear and very good for learning about the Revolutionary War, and the founding of America. Back to even Christopher Columbus. The only downside is that, at the time of this review, it does not have anything later the Constitution, like the Civil War. I also did some of the Bible History Adventures. I was really impressed at how well the information was laid out. It provided a accurate representation of Jesus’s life. Overall I thought that this was a very nice program and would give it a 9.5/10. I really liked the videos, questions, and the humor of it all. Here are some things I like about Drive Thru History. 1. The videos are funny. 3. The paintings that come with the videos are cool. Here are some things I didn’t like. 1. The Ancient History videos were too long. 2. You can’t see the whole painting at once. I think that Drive Thru History would be good for people of all ages. Mama highly recommends Drive Thru History Adventures to your homeschooling family!